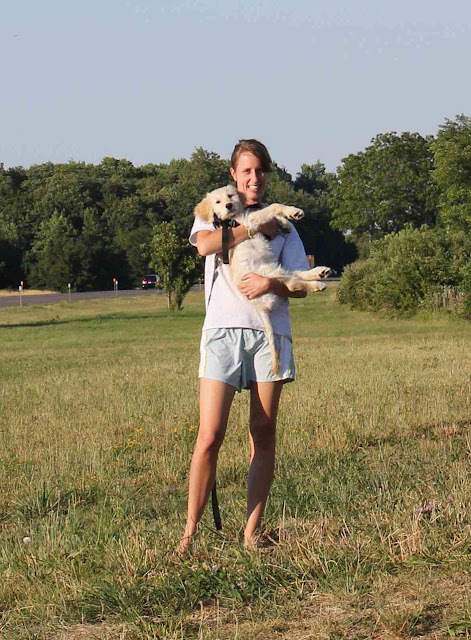 Goldilocks & Her Doodle: Puppy Photo of the Week! The Milt is in New York - we made it! The long, long drive went very smoothly. We left Dallas at 9P.M. on Friday evening and drove all through the night, crossing East Texas and Arkansas, to arrive at our Tennessee destination at 8A.M. the following morning. Jeff and I alternated turns driving, and I was very thankful that I decided not to make the trip on my own. For the entire ride, Milton sat in one of our laps up front with his seatbelt harness securely fastened. He was a very sweet boy - no crying/whining, accidents, or sickness... We were extremely lucky. We spent all day Saturday visiting with Jeff's brother and sister-in-law's family - two parents, three kids, and four dogs (three their own and one visiting for the week)! Milton was introduced to each dog individually, and they were not overly fond of our playful, youthful puppy. These dogs were a pact of little, old men and Milton quickly learned to mind his manners when he was bitten on the ear. Well, it serves him right sometimes. On Sunday morning, Jeff, Milton, and I awoke bright and early again and hit the road by 7A.M. It was a long haul - 15 hours in one day traversing Tennessee, Kentucky, Ohio, Pennsylvania, and finally New York. We were on a bit of a time crunch, so we only stopped for our customary Dairy Queen and unfortunately nothing regional (I was hoping for some Tennessee BBQ or Kentucky pecan pie). I definitely enjoyed the scenery because I had only flown into some of the airports in these states and never visited for any length of time. On our road trip, I expected to take a whole montage of photos, but for some reason I was not in the mood to snap shots possibly due to the interminable 25-hours of driving. I did however drag Milton out of the car to capture his arrival to his Momma's birth state! A close up - Milton was a little groggy when we crossed the border.